We all know how thoroughly absolute power can corrupt, and Matt Tyrnauer’s Citizen Jane: Battle for the City hypothesizes that Robert Moses, an urban-planner-turned-mogul who fundamentally shaped the horizon of New York City for the worse, was the poster child for that kind of power. This is a not-especially-subtle documentary about the perennial rivalry between Moses and Jane Jacobs, the unassuming but well-spoken writer and activist who fought for the democratization of city planning that considers the shared humanity of a city’s inhabitants. Moses had no time for such sentimentality, seeing urban areas as obstacles either to overcome or to bulldoze through (literally). Jacobs saw this sudden shift from a well-meaning plan to one that would uproot lives without the conscience to consider them, and Tyrnauer’s film exists only in two modes: recounting the biographical elements of Jacobs’s life and iterating, then reiterating, the legacies of both players involved in this decades-long battle of wits. We do gain biographical insight into both of its subjects. Jacobs had a knack for finding the elegance in writing critically about the developing city as Moses made all the wrong decisions in planning it, and Moses’ philosophy was to warm up to the city’s political infrastructure to accomplish his vision. That vision was, by all accounts, essentially anonymous, replacing the worn and cracked slums with blandly white apartment structures that would eliminate a place in which the homeowners could congregate. Tyrnauer and his host of talking heads posit the reason to be racially motivated, and we see footage that supports the theory, such as advertising that skews toward the white, upper-class families who could benefit from a pretty city at which to look or a speech from former President Lyndon B. Johnson that affirms Moses’ philosophy toward the planning of the city. Much like the “war on drugs” that would similarly target minority Americans a few decades later, this was a battle for the soul of a city that would be micromanaged to its deathbed. We gain similar insight into Jacobs’s part in this battle for the city’s soul. Her months upon years of research and articles led to a book, The Death and Life of Great American Cities, which would become the first of eight books for the writer and would greatly aggravate Moses by how critical it was toward his entire philosophy. Years pass. Jacobs becomes an activist on the social justice front as issues of civil rights enter the public arena. Eventually, Moses proposes a series of expressways that would cripple the Bronx, and a proposed expressway through lower Manhattan is rejected. There is a sense here that Tyrnauer is merely scratching the surface of Jacobs’s life and of this forever rivalry. Jacobs was, no doubt, a fascinating figure in the history of urban theory, but this documentary isn’t as insightful as it could have been. It is also typical in its presentation – archival footage spliced together with talking heads discussing the legacy of this rivalry and with readings by Jacobs and Moses themselves (Actors Marisa Tomei and Vincent D’Onofrio provide those readings that were not captured in audio). 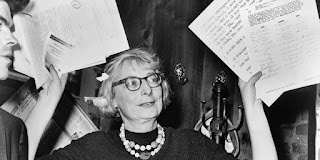 There is a fascinating telling of the story of these lives, but Citizen Jane: Battle for the City is not it.